In Military and Wartime > Swords > Show & Tell. The 1840 Light Artillery Saber was copied from a French pattern and issued to light (mounted) artillery units. In addition to the single branch guard, the 1840 Artillery Saber also differs from the 1840 cavalry saber in that it has a more pronounced curve. This weapon would remain in the Army inventory for about 50 years. During the American Civil war, over 300,000 swords of various types were imported, mainly from Solingen, Germany. Many of these had no maker marks, and this example doesn’t. One explanation was that some manufacturers were supplying both sides, and wanted to avoid embarrassment if their products were found in the hands of the enemy. It is true that some were supplying both sides, but I don’t know if that was a rationale for not marking. 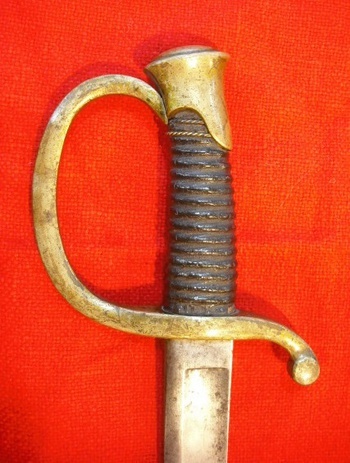 Some have said that markings omitted from swords indicate it was destined to be shipped to the South via blockade runners, and the manufacturer wanted no problem with the Union government. Frankly, I’ve seen too many unmarked swords for them all to be Confederate, so I doubt that story. The fact is that Solingen was manufacturing thousands of swords and shipping them to countries all over the world, and I believe many of them were shipped unmarked. Therefore, I am calling this an 1840 “style” artillery saber, and only saying that this pattern was imported and used in the Civil war. Although I believe the odds are that this one is Civil War, I can’t absolutely prove it. The 32 inch blade is single edged with a broad fuller. Except for a rack number on the pommel and another on the finial, there are no markings. At some point the hilt got a coating of varnish, which is now mostly gone. 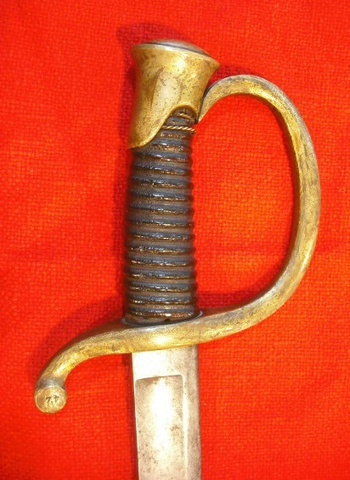 The grip is shaped similar to the 1840 Cavalry Saber, and originally had wire wrapped leather. The leather has long since gone, but a couple wraps of the wire still remain near the pommel. The two ringed scabbard is iron and unfortunately missing the throat piece. Agree chris, too many unmarked to make the CS attribution believable. The unmarked is "CS" is an old dealer embellishment to enhance desirability and value. Lots of those type of stories/ myths that were pervasive in the 1960s- 80s that have since been proven to be unfounded. Also agree with the "style" terminology. Many of this style were sent to countries other than the US/ made after 1865; so without provenance; I would agree with the M 1840 style. Yes Scott, but I do think the unmarked ones make good space fillers if you want to collect one of each official government pattern of Civil War sword, which is what I wanted to do. I'll be posting a couple more of these unmarked "styles" in the future. 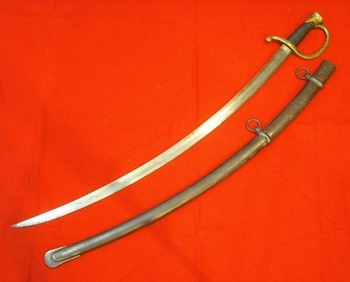 The reason I like to think this particular sword was imported for the Civil War is that there is evidence it's been in the US for at least 80 years, and in the 70 years prior to that there wasn't much reason import them. I know you'll agree that plausibility isn't proof for anyone but wishful thinkers. This is Burns Night, so I'm sitting here in a kilt drinking single malt and hoping my posts still make sense. Thanks for the love officialfuel, Armyeng, Jewels, walksoftly, DrFluffy, blunder and vetraio50. How far along are you with assembling the complete collection? I had a similar goal with firearms as a young collector-- but with a change in focus, I sold them all (I was NOT close to finishing)! The ones I've posted; the 1840 NCO and 1840 Musician's Swords, 1832 Foot Artillery, and now the 1840 Light Artillery Saber. I suppose I should include the 1860 Staff and Field I posted as one of the Civil War patterns although mine was made much later. 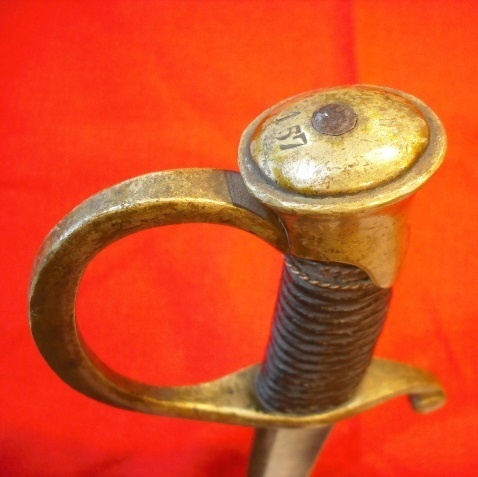 I will be posting my 186o Cavalry Saber as well as unmarked examples of the 1840 cavalry saber and 1850 Foot Officer's Sword. As you can tell, I have plenty of room for upgrading as well as adding. Do you have any earlier than the 1840s? I see them and am always amazed at how reasonable some of the earlier "Eagle Heads" are when compared to Civil War examples. Unfortunately, I don't have any pre-1840 American swords. I have noticed the Eagle Heads are surprisingly less expensive and plan to one day get a nice example of one. Thanks for the love southcop, officialfuel, Armyeng, Jewels, walksoftly, DrFluffy, blunder and vetraio50.